It was September, about three years ago, when Carl Link realized that something was seriously wrong with his health. For years, Link, then 36, had been dealing with chronic back pain that radiated out from between his shoulder blades and occasionally woke him up in the middle of the night. But recently, he had noticed some alarming new symptoms. First, there were the cold sweats that left his arms and hands clammy, and the eczema that had spread across his chest. Then, there was the intense pain that shot up and down his legs and left him breathless every time he laughed, sneezed or coughed. Most troubling of all, his knees would randomly buckle, causing him to stumble when he walked. “It got to the point that I was scared to hold my newborn daughter,” says Link, whose older son was 3 at the time. Link had seen various physicians over the years, and was currently being treated by an orthopedic surgeon for tight muscles and bad posture. But when he explained his new symptoms, he was told to see a primary care physician—and fast. Within days, he sat down with Thousand Oaks internist Dr. Adam Cavallero, who despite Link’s normal blood test results and vital signs was concerned about a neurological cause. An MRI performed early the following week revealed a golf ball-sized lesion on three vertebrae in Link’s upper back, with swelling that extended from his neck to just above his waist. 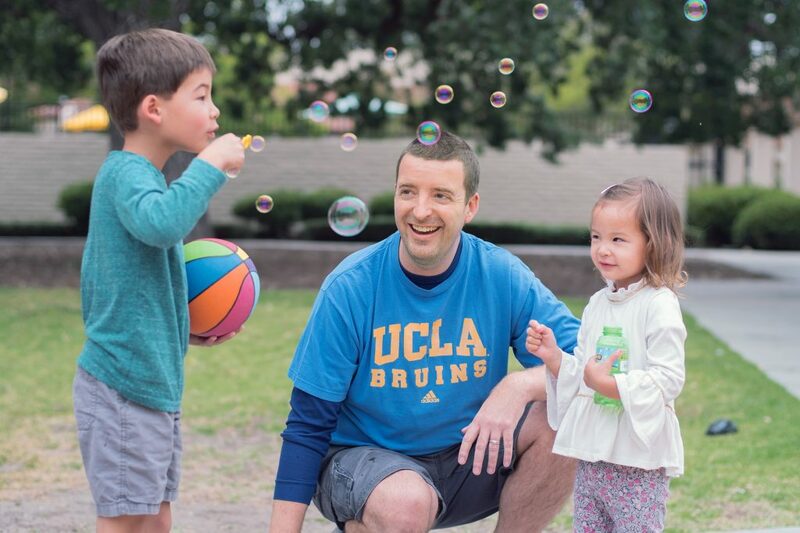 Soon after, UCLA Health neurosurgeon Dr. Luke Macyszyn performed a complicated 10-hour spinal cord surgery to remove the tumor, which pathology concluded was a rare malignancy called an ependymoma. Link says his recovery feels like nothing short of a medical miracle, and Dr. Cavallero agrees. “Before he came into see me, Carl was on the way to becoming paralyzed,” he says. In this case, a primary care doctor’s ability to look at the big picture, and consider how Link’s back pain might be connected to his other symptoms, meant getting him the coordinated and quick treatment that potentially saved his life. Read more patient stories and share your own at connect.uclahealth.org. This story ran in the Summer 2018 issue of The Checkup, a UCLA Health community newsletter on how to live your healthiest live.